In this article, we’re going to be talking about what the best guitar boost pedals are, which are available to purchase in 2019. However, before we jump into exactly which boost processors have been featured within the list, we’re going to briefly touch on what exactly a guitar boost pedal is, how it works and when you may need to use one, as we think that this will be extremely useful for more novice/beginner guitarists to learn about exactly what the role of a guitar boost unit is. What is a Guitar Boost Pedal? Where to place a boost pedal? When to Use a Booster Pedal? A booster pedal is quite simply a unit which increases the volume of your guitar signal, with minimal manipulation or discolouration of the original signal. Therefore, a high-quality clean boost pedal will only provide an increase in volume, which is an accurate, louder representation of the input signal. Almost all types of guitar boost pedals on the market are analog boosters, and therefore they have 100% analog circuitry. The reason for this is because whilst most guitarists desire a clean boost of their signal, some want to have the option to get a more overdriven & fattened guitar tone, and therefore the analog circuitry is effective in providing both sounds. Whereas, a digital pedal is not be so easily overdriven, with digital overdrive pedals not having the same warmth as an overdriven analog preamp. However, with the advancement in digital technology, and with brands such as Boss pioneering this, you may see more pop up in the future. As we previously touched upon, a boost pedal simply increases the volume of the input signal, by a variable amount (based on the interface settings) as soon as the pedal is turned on and engaged. 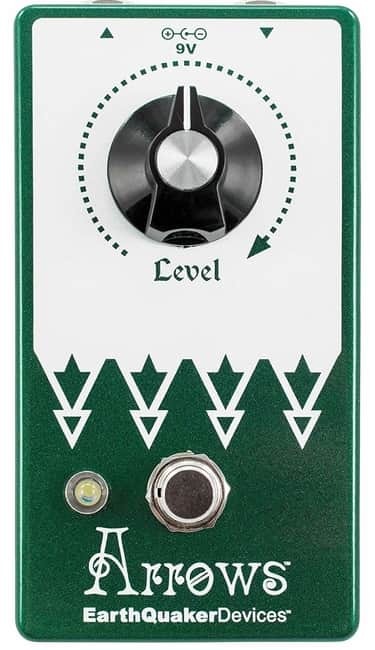 Therefore, this type of pedal is predominantly used alongside other guitar effects pedals, so where would be ideal to place it within the signal chain? Generally speaking, there are no set answers for this, although we’ve seen guitarists achieve a great sound by placing the boost pedal towards the end of the signal chain, post-tonal colourization and processing. By doing this, the signal is sonically ideal and just requires boosting. 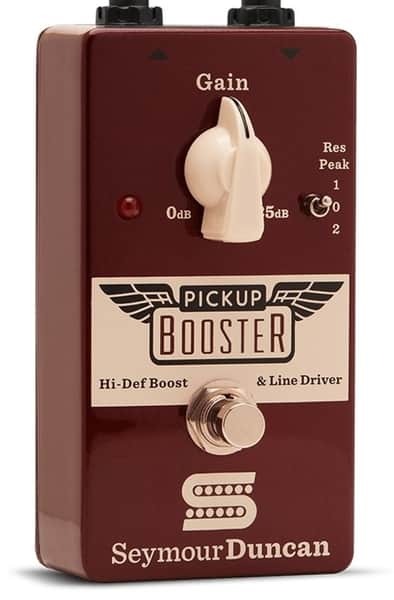 Since booster pedals increase the dB volume of the input signal, they are more commonly used in a scenario that requires such boosting, i.e if you’re a lead guitarist and require a little extra volume for a guitar solo… Additionally, you may want to use a booster pedal to provide emphasis and a more anthemic-sounding last chorus, to really get the audience ‘feeling the music’…. It’s a shame that your bassist will claim it was all his doing, but let him think that, we know the truth! In summary, it’s generally up to you where the pedal goes, although our advice is to place is later on in the signal chain. So, that’s it for talking about the details surrounding booster pedals, let’s actually get to discussing the particular units that we’ve featured… Without further ado, what are the best guitar boost pedals of 2019? The Spark Booster pedal by TC Electronics is a compact, highly portable guitar boost processor, ideal for almost every guitarist’s pedalboard. The unit itself is built using a durable metal chassis, so that it’s able to be taken on the road and withstand the occasional hit. The Spark Booster unit features all-analog circuitry, so you’ll hear a warmer output sound. Additionally, the when disengaged, the unit provides ‘true bypass’ which means that it won’t interfere with the input signal, and immediately relays it to the output. A nice feature of the TC Electronics Spark pedal is it’s in-built ‘PrimeTime foot pedal technology’, which allows for the user to apply momentary boost, which will engage once the user presses on the foot-switch, and stay engaged until the foot-switch is released. This feature is particularly good to apply momentary boost dynamics to you guitar riffs and solos. Because of this ‘PrimeTime’ function, TC Electronics have built the foot switch in a way so that engagement/disengagement is almost silent when it comes to the physical switch and springs… As you’ll hear Steve Morse demonstrate, from the demonstration video of the pedal in action further below, the unit is incredibly quiet, so he doesn’t even need a noise-gate. Additionally, the unit also has in-built 3-band EQ controls, so you have the option to whether or not you wish to change the tonality of the signal during the boosting process. As you can hear from the video demonstration featured below, the unit sounds extremely good, and can provide both a clean or somewhat overdriven boost depending on your preference. Additionally, the 3-band EQ also helps refine the output sound. We don’t like to say what we’d improve with pedals that are incredibly cheap, because any improvement would directly affect this USP. However, we simply can’t fault this unit! The Spark Booster pedal is for the guitarist who has a smaller budget, but wants a pedal which even some of the greats use (with the video demonstration below showing Steve Morse from Deep Purple using it in his rig). 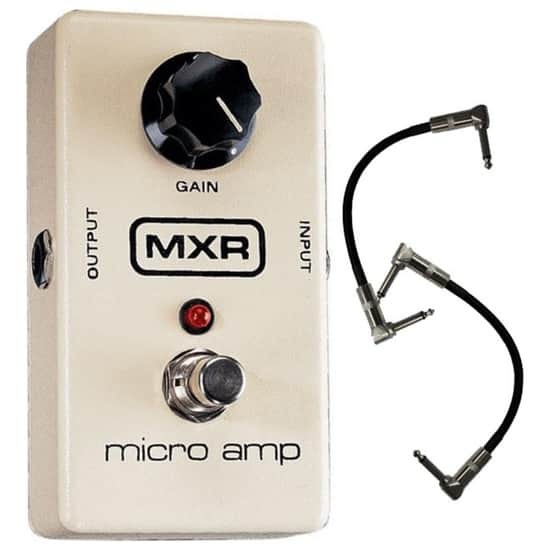 The MXR M-133 Micro Amp is a highly compact analog booster pedal, provided by the expert engineers of MXR & Jim Dunlop. The unit itself is very simple in its operation and functionality, providing the user with 1 gain control, to adjust the level of gain boost applied to the signal during pedal engagement. The unit is capable of up to 26dBs of boost, which is 6dBs higher than the similarly priced TC Electronics Spark Booster unit… Although the M-133 does not use true-bypass, and utilizes a hardwire bypass circuit… so expect a little, added warmth and compression to the signal, even when the unit is disengaged. 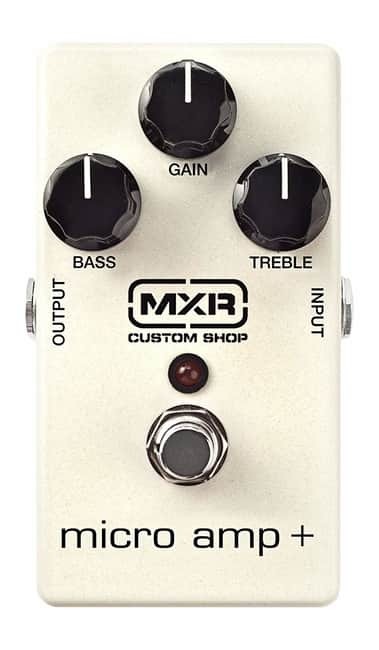 As with the majority of MXR pedals, this unit is solidly built and will be able to last for years on end. However, in case you get a unit which malfunctions, there’s no need to worry as MXR provide a 1-year manufacturers warranty on their products! As you can hear from the video demonstration that we’ve featured below, the pedal provides a nice level of boost to the signal. This unit not only boosts the signal, but also helps thicken the overall sound, which we really like! However, since the video demonstration shows the pedal in a controlled environment (with minimal background noise, you can hear some slight frequency noise, so be aware of this if you’re going to be pushing the gain to 12… It will produce an overdriven sound with a little noise, but that’s completely normal. As per usual, we don’t like to say what we’d improve with pedals that are incredibly cheap, because any improvement would directly affect this USP. This unit is a great buy for someone on a budget, who wants a simple unit. The MXR M-133 is ideal for the guitarist on a budget, who wants a large amount of boost potential (up to 26dBs), without requiring the True Bypass that other similarly priced pedals have. Instead, this unit helps boost and thicken up your overall sound… And is incredibly simple to use. Electro-Harmonix are a company that have been in the guitar effects industry for over 50 years, they provide hand-built, high-end music equipment which is capable of transforming your guitar sound… and their LPB-1 Linear Power Boost Nano unit is no different, providing a true-bypass, all-analog circuit which will boost your guitar on request. The unit is based on the 1968 LPB-1 which EHXs released all those years back. The pedal itself is small in size, and built from EHX’s standard die-cast metal chassis design. It can be operated very easily, as the interface is made up from the boost control knob in conjunction with the on/off foot-switch. Additionally, it can be powered from battery power and from a power adapter, and its internal 9v battery can easily be changed by removing the 4 screws located at the bottom of the unit, and opening the battery compartment. The unit acts as a preamp, and as the boost knob is turned (clockwise) more, it saturates the output sound more and more. As you can hear from the video demonstration, the pedal adds a good amount of boost to the sound, but equally adds more treble frequencies to the mix as the boost knob is turned up. 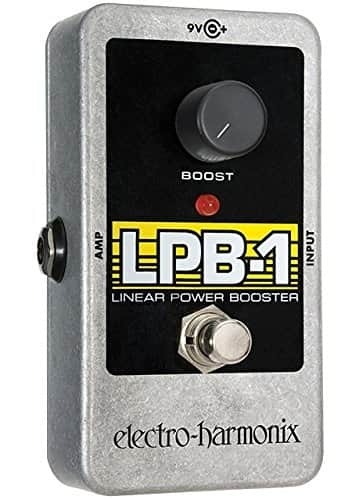 This is a very unique sounding pedal and has been created to commemorate the original LPB-1 unit. Because of this, it cant really be compared to the other units which are priced around the same price-point. This unit is definitely for fans of the original LPB-1 booster pedal’s sound, and for anyone who simply wants a high-quality booster pedal, that also emphasises the top-end frequencies when the gain is pushed higher. The MXR M293 is a highly compact booster pedal, which combines the analog preamp circuitry of the famous EP3 Echoplex which was a famous delay processor, not necessarily used for the purpose it was meant to, with it being common for guitarists to disengage the delay effect, and just run their signal through the preamp section, with it having nice-sounding vacuum tubes. Additionally, this unit also features the boost section of the MXR Micro Amp unit, which is a widely successful pedal. Therefore, you’re getting a lot of ‘bang for you buck’, in one small unit. As always with MXR products, they’re built to last, with a strong metal chassis and you have a 1-year manufacturers warranty for reassurance. As you can hear from the video demonstration, the pedal really does add the tube-like warmth that the EchoPlex was known for providing… And because of this, you’re really getting that edgy-sounding top-end. Despite the saturation of tone, you can still hear a lot of clarity over the entire frequency spectrum… And therefore, we love it! Yeah, we simply wouldn’t want to improve anything. The EarthQuaker Devices Arrow V2 is the second adaption of the Arrow series, taking influence from the original versions positive aspects, adding some more and getting rid of the flaws. With that being said it features all-analog circuitry, so that you can get that nice warm sounding boost, and silent relay-based switching, which means that engaging your pedal won’t wake up your bassist. The unit also provides true-bypass, so it won’t interfere with your guitar signal when disengaged. Additionally, as you can see from the interface, it’s incredibly simple to operate, having 1 ‘Level’ knob, which boosts or cuts the signal. As for the physicality of the unit, it’s built with a metal chassis, and resembles a 60’s-looking unit, which we really like! The unit is very versatile, in providing a relatively clean boost when at lower levels, and a more saturated boost at higher levels. The only issue we find is, you may want an extremely level of clean boost… Which wouldn’t necessarily be natural for this unit to provide, as it will simply saturate your sound as you crank up the boost knob. However, overall it has a very nice tone. Ideally, you’d want to have a tone knob and a boost knob, to have a little more isolated control of the tone and volume, without them being so correlated by having a single knob to control both. This unit would be ideal for fans of the original EarthQuaker Devices Arrow boost pedal, alongside guitarists who are looking for a 1-knob, boutique-looking unit for their guitar rig. If you like how the video demonstration sounds, this unit may be for you. The Xotic EP is a small, well-built booster pedal for electric guitar, that combines analog circuitry which is based on the iconic EP3 Echoplex delay unit, alongside the portability and durability of a pedal that can fit on any guitarist’s pedalboard. The pedal provides true-bypass, and even has two internal DIP switches, which lets you pick between the boost level and EQ settings. One switch provides a bass boost, and the other provides a brightness boost. The unit can provide up to 20dBs of boost, and has a 9v internal battery which can be accessed via the plate located at the underside of the unit. It can also be powered by a 9V power supply, or even an 18V power supply if you’re looking for additional headroom. As you can hear from the video demonstration, the Xotic EP pedal is highly versatile, providing a nice clean boost with plenty of high-end clarity when the knob is around 12 and the brightness boost DIP switch is engaged…. Through all the way to a dirty, saturated, overdriven guitar signal, when the knob is cranked up, and the bass boost DIP switch is engaged. This unit not only provides versatility, but all in one small-sized physical case. There’s not much that we can suggest to improve, and the Amazon review ratings suggest this too! 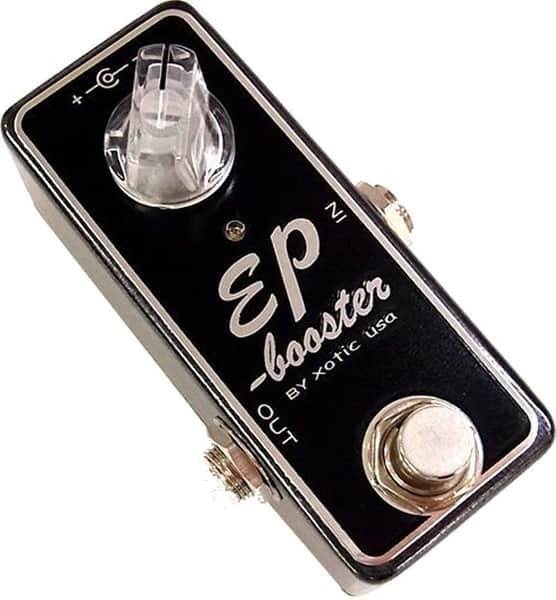 The Xotic EP boost pedal is simply for the guitarist who wants to have a versatile unit which can provide both clean, resonant boosts through to dirty, overdriven guitar sounds. The Seymour Duncan Pickup Booster unit is a true-bypass booster unit, with a low-noise circuit design, so that you can get a nice clean boost, whilst adding some thickness to the signal! The unit itself is designed to integrate well with your guitar’s pickups, with the its resonance switch providing 3 settings different parameter settings, which include unaltered, humbucker and high-output humbucker…. Although these settings will not be as evident with guitars which feature humbuckers, as opposed to the fender squire with it’s single-coil pickups. However, the unit will provide some great-sounding saturation tones as you crank up the gain. 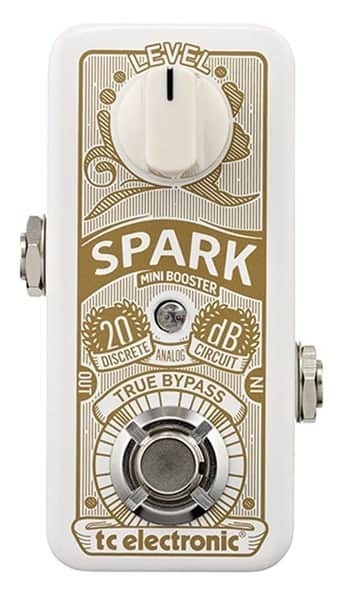 This pedal provides up to 25dBs of clean boost, and can really provide a lot of sonic personalization, in conjunction with the resonance settings. Additionally, a nice feature of the unit is the fact that it provides true bypass, and has an easy access battery door, located at the bottom of the unit. As you can hear from the video demonstration, the unit sounds great on both the Gibson Les Paul ‘Humbucker’ and the Fender Squire ‘Single-Coil’ setups, and with the resonance settings, it really is versatile. We think that the pedal really provides a vintage, bluesy overdrive, which sounds fantastic. Additionally, the high-output resonance setting is perfect for the soloing guitarist who requires that 80’s rock, piercing overdrive. Its quite a unique sounding pedal, and provides more of a bluesy-sounding boost/overdrive, through to piercing solo sounds. This unit is definitely for the guitarist who wants to either play blues or 80’s rock… The resonance settings really make it versatile for these kinds of playing styles. 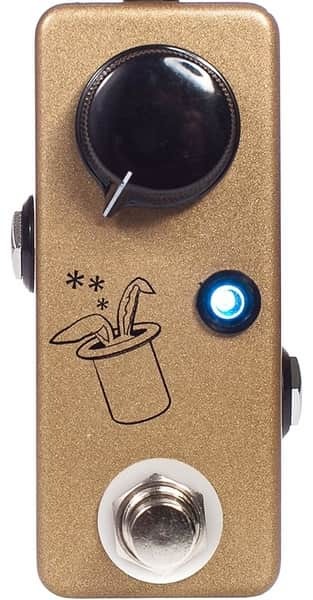 The JHS Prestige booster pedal is a very small, cool-looking, versatile little unit. Although the pedal only has one knob control, it can be used as a preamp, buffer and natural overdrive. The inital 25% provides a natural buffer/enhancer, capable of boosting a signal for long cable runs, and to add some brightness to the signal. At 25 – 75%, the unit provides a dB volume boost, which allows for a nice enhancement during guitar solos, creating more dynamics and saturation on the signal. Post 75% and the pedal provides an overdriven boost, simulating an overdriven tube amplifier. Putting it simply, this unit is very basic, and JHS want it to be this way, as the sound is all that matters right? At lower boost settings, the pedal does a great job of increasing the dB signal without interfering with the tonality too much, which is exactly what you want from a boost unit. Although, when you start pushing the gain, up it does dirty the sound… However, we think that some of notes played (particularly on the bottom E string, when you move down to the neck G, F# and F note) sound a little buzzy. For the guitarist who wants a simple pedal to operate, ideally for clean boosts, as we aren’t too keen on the higher gain sounds that it creates. Therefore, we can’t say that we’d particularly recommend this, over the similarly priced Seymour Duncan Pickup Booster & the MXR M293. However, it’s all about personal preference, and if you like the sound of the unit, then it’s ideal for you! 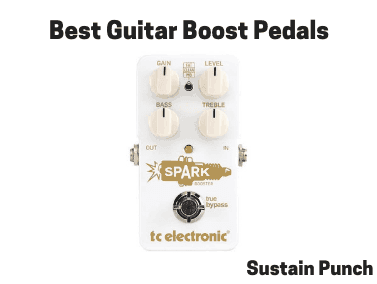 The Spark Booster pedal by TC Electronics is a regular-sized, guitar boost processor, which is a little larger than it’s baby brother, the Spark Mini Boost pedal. The main difference between the regular version is that it provides even more boost capability, with a 26dB range, as opposed to the Spark Mini’s, still impressive 20dB range. Similarly to the mini version, the Spark Booster features in-built ‘PrimeTime footpedal technology’, which allows for the user to apply momentary boost, which will engage once the user presses on the foot-switch, and stay engaged until the foot-switch is released. This feature is particularly good to apply momentary boost dynamics to you guitar riffs and solos. Even considering that this is the more expensive product in the TC Electronic Spark series, it’s still a very small price to pay for the sheer quality you’re getting. 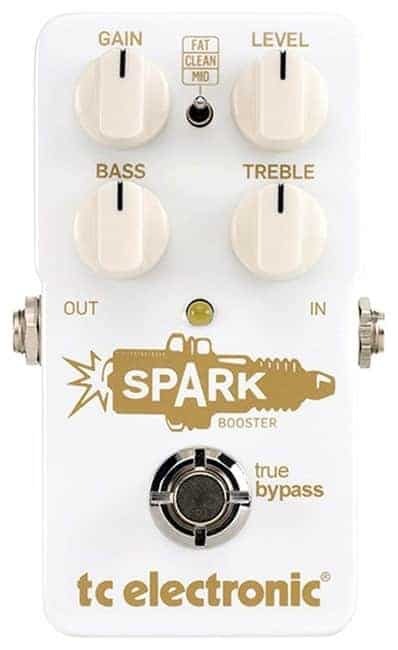 The Spark Booster pedal is for the guitarist who has a mid-range budget, and requires the additional dB boost capacity that this unit offers over its younger brother. As you can hear from the video demonstration, it sounds awesome… And the fact that the likes of Steve Morse from Deep Purple uses the Mini version, is a real testament to the Spark series. 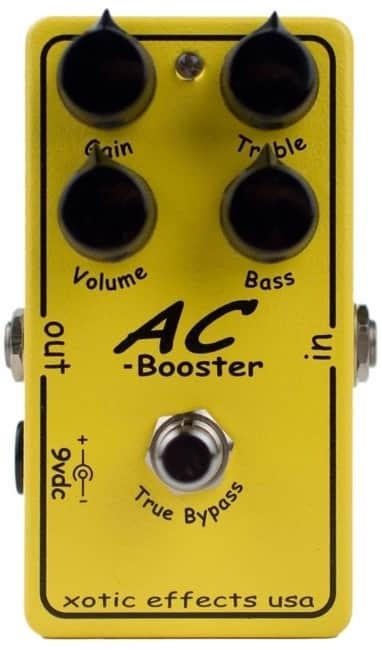 The Xotic AC booster pedal is an extremely well-loved boost pedal, capable of not only providing up to 20dB’s of bosst, but an adjustable +-15dBs of two-band active EQ. The unit has all-analog circuitry, meaning that you’ll be able to hear that nice warmth from the output… And as you crank the gain up, you can really get a nice overdriven sound from this pedal. Two aspects that we like about the AC booster pedal are, that firstly it provides True Bypass. And then secondly, it has separate Gain and Volume control knobs, allowing you to more easily achieve higher boosted clean tones, which most other units on the list don’t allow. As you can hear from the video demonstration featured below, the unit provides a crisp, minutely overdriven sound when the gain is completely off. But as soon as you crank up the gain, it really does produce quite a thick, darker sounding overdrive. Additionally, the 2-band EQ also helps refine the output sound. The Xotic AC booster pedal caters more towards the guitarist who likes to have a minimal level of overdrive when engaging their boost pedal… Take a listen to the video demonstration, and you’ll hear the slight amount of overdrive that comes through the mix, whilst on the clean setting. 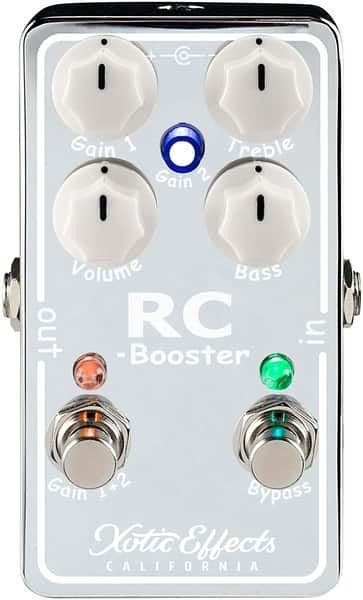 The Xotic RC booster V2 pedal is an extremely well-loved boost pedal, and is the second edition, leading on from the original RC booster unit. The RC booster V2 is capable of not only providing up to 20dB’s of bosst, but an adjustable +-15dBs of two-band active EQ. Additionally, this unit has 2 separate gain settings, which can be used separately or in synergy to shape your tone. Not much that we can think of! For the guitarist who’s a fan of the EP-3 EchoPlex’s preamp, mixed with some major overdrive tones. 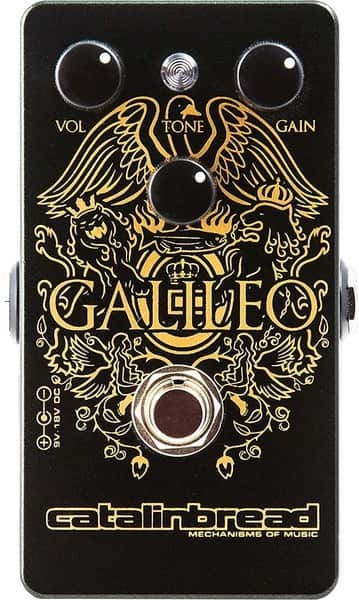 The Catalinbread Galileo is a dual function guitar effects pedal, which can be used as both an overdrive and booster unit. The Galileo’s internal circuitry is based on the Vox AC-30’s preamp section, and therefore if you’re a fan of Brian May’s guitar sound in Queen, you’ll certainly like this unit. As for the physical features of the pedal, it has a sleek black metal casing, with golden decal, and has three operation knobs to control the volume, gain and tonality. We particularly like the fact that the gain and volume controls are kept separate, as it really gives you the versatility to gain a clean boost, unlike some cheaper pedals which don’t feature this. As you can hear from the video demonstration, the pedal is can really provide some sweet, piercing overdrive sounds that would be ideal for any lead guitarist. Now, you can hear a more subtle, cleaner overdriven sound at 1:20, which would be ideal for most genres. With the preamp section of the iconic Vox AC-30, there’s really not much left to improve! The Catalinbread Galileo would be ideal for the guitarist who’s looking to get that Vox AC-30 sounding overdrive, without actually having to purchase the amplifier. 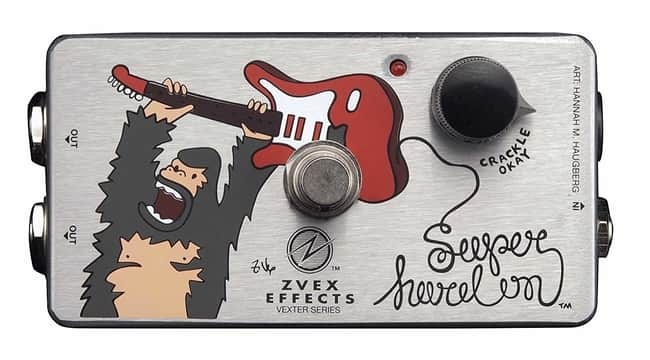 The ZVEX Super Hard On booster unit for guitar is a simple-to-use, boutique looking effects pedal. Simply put, if you purchase this other guitarists are going to be asking “what is that pedal”, and will be wanting to hear how it sounds. This analog unit with True Bypass can be operated on a 9v internal battery or a 9v power adapter, giving you the freedom to potentially not require a plug socket. The internal circuit uses a very sensitive transistor, and hence when you turn the single ‘gain’ knob up, you’ll really get a muddy sound. As you can hear from the video demonstration, this unit sounds muddy when you turn the gain up! There isn’t necessarily anything that we would improve, but this unit definitely satisfies a niche-market. Ideally, for a pedal at this price-point, having a separate gain and volume knob would be helpful, so that you can achieve a clean boost. This unit is for the guitarist who likes that muddy-sounding boost! The MXR M233 Micro Amp Plus is a relatively compact analog booster pedal, provided by the expert engineers of MXR & Jim Dunlop. The unit itself is very simple in its operation and functionality, providing the user with 1 gain control, to adjust the level of gain boost applied to the signal during pedal engagement. The unit is capable of up to 26dBs of boost, which is 6dBs higher than the similarly priced TC Electronics Spark Booster unit… Although the M-233 does not use true bypass, and utilizes a hardwire bypass circuit… so expect a little-added warmth and compression to the signal, even when the unit is disengaged. Additionally, the main difference (other than physical size) between this M233 model and the M133, is the 2-band EQ which allows you to further control the overall sonic landscape of your guitar’s output, with the ability to scoop or boost certain desired frequency bands. With the added 2-band EQ settings, it really provides additional versatility to your sound, as you can hear from the video demonstration. This unit is a great buy for someone looking for a reliable unit, able to provide a substantial amount of boost.. However, we wish it included a separate volume knob, as gaining a substantial amount of clean boost from this unit will be difficult… Because when you turn up the gain, you’ll begin to overload the preamp, and thus add overdrive alongside extra dB volume. The MXR M233 is ideal for the guitarist who wants a reliable boost pedal, able to provide a considerable amount of ‘overdriven’ boost. Since this unit does not run on True Bypass circuitry, it will provide a nice analog-sounding warmth with your sound regardless of it being engaged or disengaged. Before we say anything, we were completely blown away with the level of depth and thought that has gone into creating the Jackson Audio Prism, not only from an audio perspective, but from a design/visual and usability perspective, with it really giving back the guitarist control of their sound, to quite a specific depth. With that being said, this unit not only boosts your input signal, but there are additional features which include tonal control and signal thickening/thinning. Additionally, from an aesthetic perspective, this unit does not disappoint! It’s incredibly beautiful, sleek and has a very cool LED light. Well, we would talk to the moon and back about the unit’s versatility! However, take a listen to the video demonstration below to really hear for yourself as to how the unit sounds. 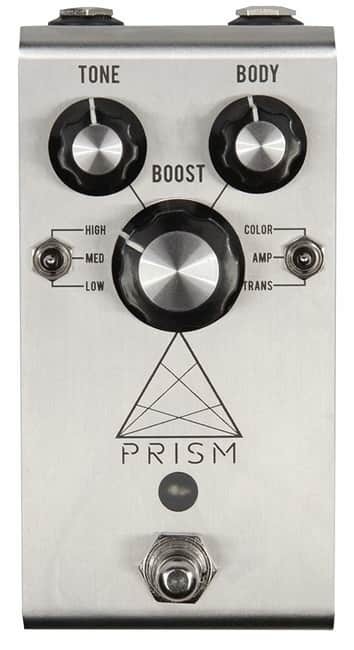 The Jackson Audio Prism is for the guitarist who has a substantial budget to spend on a bespoke, ultra high-quality boost pedal. Well, we hope that our review on the top 15 guitar boost pedals has been informative, and helps you decide which boost pedal is right for your sound. If you have any questions, feel free to email us! Our email is on our about us page.